At Where The Fruit Is, we frequently see what a huge difference Forest School can make to the lives of children and also the leaders themselves. Here are just a few snippets from testimonials. I felt deeply inspired by the Forest School philosophy when I first came across it in Rome in 2015, so much so that I moved myself to England to complete my level 3 training with Sarah Lawfull. Sarah was enthusiastic, passionate, kind and encouraging from the moment I first emailed her to my last day of working with her as a Forest School practitioner before returning to Australia. She went above and beyond to ensure we not only covered the training content but that we went outside together and experienced the ethos and practice of Forest School. For me, Sarah inspired a way of being that has continued to enrich my work with children since returning to Australia. I am a practitioner of mindfulness and I am very passionate about the teaching of mindfulness in an educational setting. Forest School training taught me the power of nature to cultivate an attitude of mindfulness. Through the simple practice of exploring the senses, becoming aware of colours, sounds and textures in nature and discovering the hidden plethora of beautiful creatures, I noticed how the practice of mindfulness was already there, so naturally. Since returning to Australia, I have spent more and more time in nature with children and I continue to be inspired by their engagement in simple activities like making a grass chain or building a doggie den. They then go on to share these activities with their parents and friends, making connections and building relationships. Forest School has touched my heart in the most profound and beautiful way and I am continuing to study and share the philosophy here in my home country. Sarah was an inspirational mentor because she believes in Forest School with her whole heart and to me the most wonderful teacher is one who walks her talk. Sarah does this with every step. I have known Sarah Lawfull over 15 years as a well-respected colleague and friend. 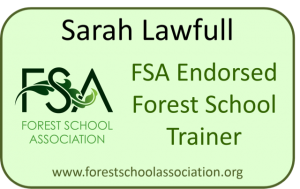 While I was employed by Oxfordshire County Council as a Senior Early Years Advisor we worked very closely with the Forest School Team, of which, Sarah was a member. We collaborated on projects to help schools and settings establish Forest School practise. We worked together to support settings that needed to improve their practise including their outside environment. Sarah has an impeccable set of principles that underpin the teaching and learning that she undertakes as an advisor and trainer. She has a great sense of humour which makes her fun to work with. When looking for creative solutions Sarah has a huge amount of expertise and experience to call on. Sarah is always keen to continue with her own professional development so that she can continue to give the best training and advice possible. "Every session is completely different, every child is a complete individual and I just love being able to spend time with them giving them the time and space to explore and grow in the woods"
"Sarah helped me believe in myself and gave me the confidence that I too can support and guide others"
"Becoming a FSL has changed the way I parent, partner and befriend, it has opened my eyes to true self-reflection and a world of constant learning." "Sarah has a clear and infectious passion for people’s development and the outdoors. She gets joy from seeing the impact of the outdoors on her students." I joined level 3 training with Sarah feeling very much like a rabbit in the headlights. I was the only non-teaching member of the group and felt very much out of my depth. However within the first hour I felt myself relaxing and my confidence beginning to grow. Over the first part of the course Sarah had clocked my insecurities and very cleverly supported me in session without making it obvious to the rest of the group. As the sessions progressed she also noticed that I was struggling with the ‘jargon’ or ’teacher speak’ in the room. Sarah supported me in session by leading discussions with more user friendly descriptions! I found Sarah a very kind and supportive, caring individual who guided me to seek out the ‘can do me’. Sarah helped me believe in myself and gave me the confidence that I too can support and guide others. Finding FS I think was fate. It came to me at a time in my life that I had lost a great deal of self-confidence and self-esteem. It enabled me to seek my innersole, and question what do I really want to do, not for the kids, my husband or work, but for me. I think I went through pretty much every emotional roller coaster during my course, but actually becoming a FSL put me on another one! Out there on my own I am Nicky, the Forest School Leader, and I love it. Every session is completely different, every child is a complete individual and I just love being able to spend time with them giving them the time and space to explore and grow in the woods. Becoming a FSL has changed the way I parent, partner and befriend, it has opened my eyes to true self-reflection and a world of constant learning. It was a great privilege to be part of the team which brought Forest School into Oxfordshire twenty years ago, and no surprise that it is now firmly established within many schools and other provision working with children, young people and their families. Sarah has developed her own considerable expertise throughout these two decades, bringing her to a point where she can launch this innovative social enterprise, reaching out particularly to those who find it difficult to succeed in a school environment. As a skilled trainer, too, the quality of the courses offered is high, and often transformational for those practitioners and parents who participate. 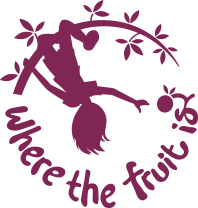 I expect ‘Where The Fruit Is’ to make a valuable contribution to the evolution of Forest School in Oxfordshire and beyond. How to go to the toilet in the woods?